Last August, an article was published in New Phytologist that claimed a transgene added to rice could increase the fitness of a weedy relative. The paper was covered in the media pretty widely. When I read the paper, I didn’t think the authors presented nearly enough data to support their conclusions. You can find my criticisms in detail here. I think it is worth revisiting this paper now for a couple of reasons. The first is that two formal criticisms of the original paper (as well as author responses) have now been published by New Phytologist. The first letter was written by a group of prominent scientists led by weed scientist Jonathan Gressel. Gressel et al. point out several deficiencies in the original report, but the most important is that Wang et al. did not provide enough information in their article for independent scientists to replicate the study. The second letter criticizing the Wang paper was written by scientists from the Flanders Institute for Biotechnology in Belgium. Grunewald & Bury point out several of the same deficiencies I wrote about earlier. In particular, they mention the differences between the transgenic line and the parental line as well as the unaccounted possibility of transgene location effects. In fact, the observations by Grunewald & Bury are so similar to mine, it really is amazing the original peer reviewers did not find the same problems. The authors of the original paper have responded to the criticisms here and here. If you are interested in this topic, I think reading the criticisms and the author responses are worthwhile. I personally don’t think the author responses clarified many of my original critiques, even though they were shared by the letters. So basically, the authors believe that the effects are, in fact, due to over-expression of the EPSPS gene (even though I don’t think their data are anywhere near conclusive). If their hypothesis is true, though, this effect should be observed in other plants where EPSPS is being over-expressed. Conversely, if over-expression of EPSPS in other plants didn’t have similar effects, it seems that there is probably some other explanation (like closely linked genes). Palmer amaranth, a very problematic weed in the US, has evolved resistance to glyphosate by increasing the number of EPSPS genes it has. Remarkably, Gaines et al. showed glyphosate-resistant Palmer amaranth increased EPSPS expression by up to 35-fold compared to susceptible biotypes. If over-expression of EPSPS leads to quantifiable benefits to fitness-related plant growth parameters, as Wang et al. proposed, glyphosate-resistant Palmer amaranth should be a perfect test organism. Wang et al. claim that the rice hybrids they tested exhibited a 2-fold increase in EPSPS expression compared to susceptible hybrids, and that was enough to cause the effects they observed. If a 2-fold increase in EPSPS was enough to increase fitness in rice, surely a 35-fold increase would have dramatic effects in Palmer amaranth. Table 2 from Giacomini et al (2014). Notice the column of P-values for EPSPS copy number; ALL of them are nonsignificant. 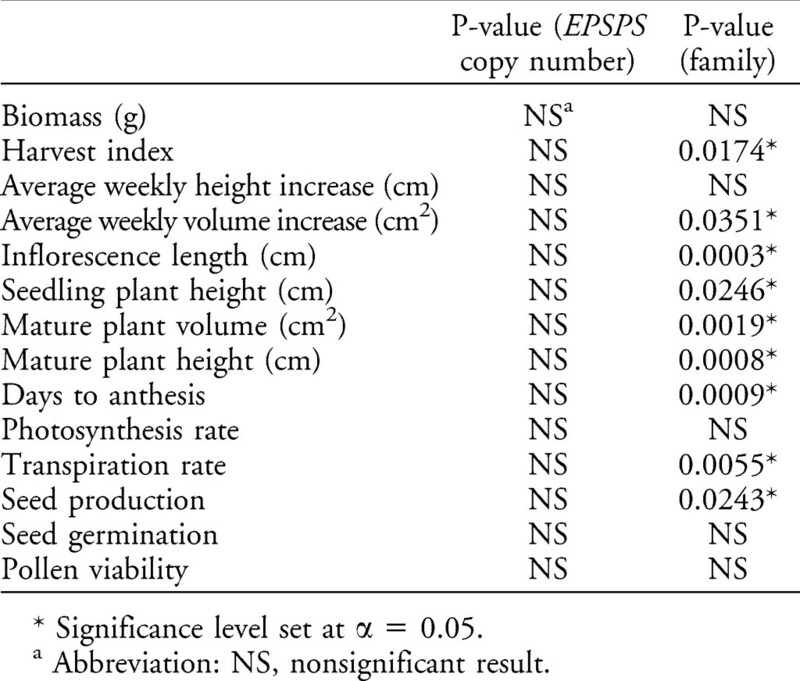 This suggests that there is very little evidence that even high levels of EPSPS expression had an effect on growth of the plant. 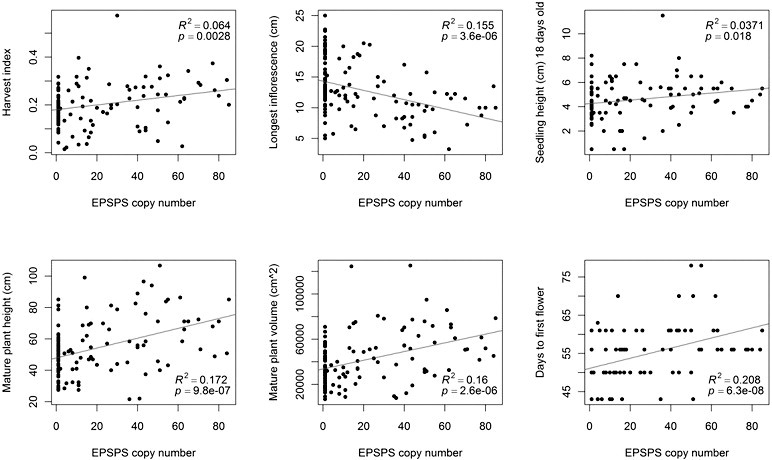 It seems unlikely that a 2-fold increase in EPSPS would cause dramatic effect in rice, while an 80-fold increase in EPSPS gene copy number would have no impact on similar responses in Palmer amaranth. This suggests that the results in the Wang et al. rice paper are very likely the result of something other than EPSPS expression, as I and others have suggested. This is a great example of why it is so important to use multiple genetic backgrounds if you want to isolate the impacts of a particular gene. And this is exactly what Wang et al. failed to do in their study on transgenic weedy rice hybrids. So while the Giacomini et al. paper studies a different weed species and a different mechanism of EPSPS over-expression, I think the results provide quite a lot of evidence contrary to the relatively weak hypothesis proposed by Wang et al. Darci Giacomini, Philip Westra, and Sarah M. Ward (2014) Impact of Genetic Background in Fitness Cost Studies: An Example from Glyphosate-Resistant Palmer Amaranth. Weed Science: January-March 2014, Vol. 62, No. 1, pp. 29-37.